If you have a photo or story to share about your 9:00 am hour I’d love to see it! Please tag your post 1 Day 1 World Project for easy reader searches and/or link your post in a comment below so we can all enjoy the view. Together we’ll build a virtual 24 hour day filled with images from around the world. If you’re new to the 1 Day 1 World Project please take a look at my introductory post here. This 9:00 am post will remain open for submissions until the end of Saturday, October 4th and a new post for the 10:00 am hour will open for entries Sunday, October 5th. Your BBQ has a great colour and it is an interesting contrast to the greens and browns in the picture. Here in Germany we are preparing for autumn, too. We really like the color of the BBQ too, Trina. 🙂 Thanks for linking your post today! I hope the joys it has given the family is not over yet. 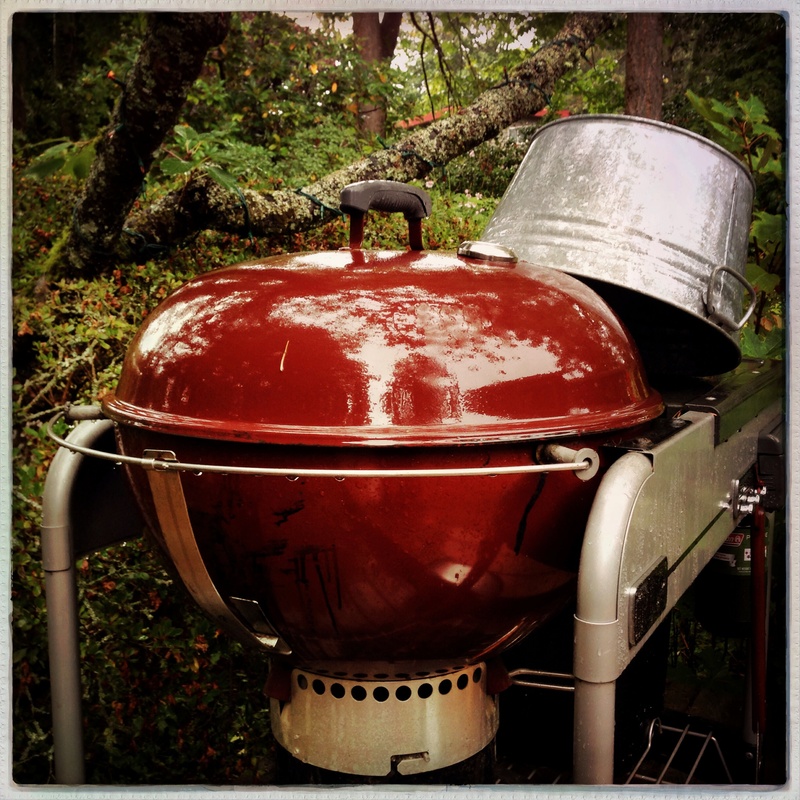 You can still bbq in the Fall, can’t you? Hoping you get lots more BBQ weather before winter sets in. Nice interpretation, Yvette. 🙂 Actually the bucket was full of ice and cold drinks last weekend and I tipped it over on the grill to dry out a few days ago. The rain didn’t help. 😉 Thanks for your nice comments! Pingback: 1 Day 1 World Project 9:00 am – 10:00 am | "AND THEN LIKE MY DREAMS"
It’s great to see your opposite season, M-R! Finally hour 22 has arrived! I have been saving pictures from a wonderful walk that Maggie and I took along Crown Beach in Alameda. It was a gorgeous day with views of S.F. on the horizon. Very fancy BBQ. Ours is no where as nice; winter over the years has taken its toll on it (last year the snow covered the whole thing!). That’s a cheerful BBQ! Is it a gas one? My daughter and partner used to have great South African style braais every summer with all their S African friends who were living in and around London – it almost felt as though I’d been over to SA for a quick visit! Doesn’t happen so much now though. It tells of many happy days, Lisa 🙂 I’m doing badly here. I no sooner seem to think ‘ah, yes- 8 till 9’ than the next time slot comes along! Are there only 3 more slots to go? What will you do then? I’m back, in the nick of time. (I hope!) I had my photos for last week but left them too late. I was taking photos for the Autumn leaves challenge on my way to zumba yesterday morning when I realised I was in the right time ‘frame’. 🙂 I had my 6WS to post so have squeezed it in this morning. Hope that’s ok with you? I didn’t realise that, Lisa, so I’ll bear it in mind for the future, thanks. 🙂 Have a happy week! I’ll be over to see 10-11.00 shortly.